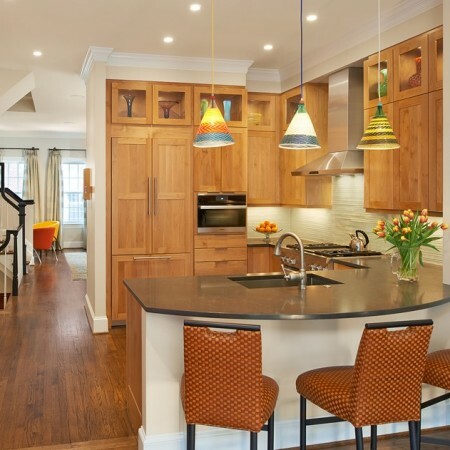 A color- and craft-filled kitchen was envisioned for the heart of this townhouse in downtown Bethesda. This, along with the desire for quality appliances and a workspace that would welcome multiple cooks in a small area, inspired the design of this cook- and guest- friendly intimate kitchen. 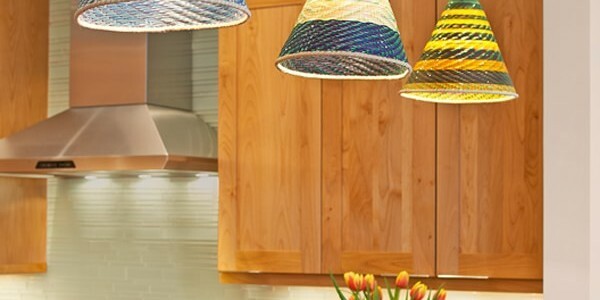 The stylish pendant lights in the kitchen were hand made from recycled soda bottles and straw by the Esperara-Siapadara people of Colombia. The kitchen has beautiful clean wood and glass surfaces, accented by gorgeous pieces of hand-blown glass. © 2015 Carol Freedman Designs. All Rights Reserved.